NTK Hunter GT 8 to 9 Person tent is a freestanding structure with a high waterproof rating, fiberglass poles, and 2 doors, and with a very affordable price. NTK Hunter GT 8 to 9 Person tent. This tent is available on Amazon so it might be also in your local Amazon store, they have them on 5 continents. This NTK Hunter GT 8 to 9 person tent is the largest in their completely new series which also includes Hunter GT 3 to 4 people, and Hunter GT 5 to 6 people. As fas as I remember this is the first series that comes with such a camo design, this brand is well-known for their dark green-blue color tents. 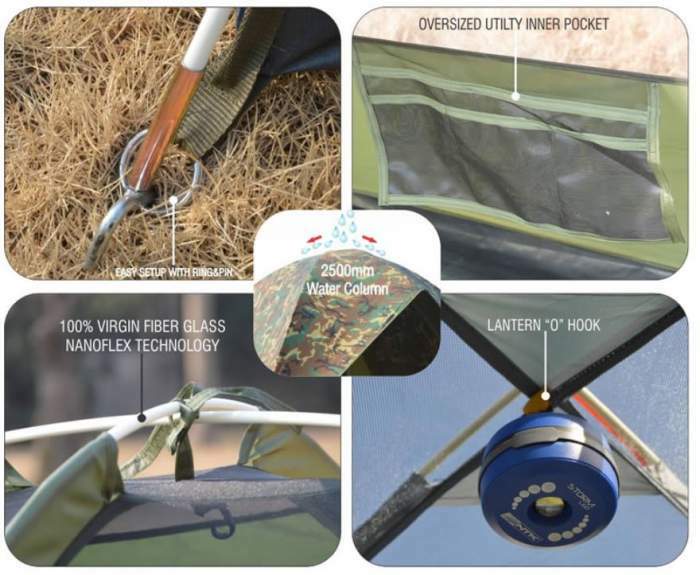 So this is a fully freestanding tent with the fly that attaches to the corners. The fly is not a full coverage type and this means that you do not have vestibules in front of the doors. But it covers two sides all the way to the ground, see the picture below to see what I mean. The tent is a dome style with two doors and it comes with a divider so you can create two rooms. The fly goes to the ground on the sides, but there are no vestibules. Capacity-wise, the declared capacity is 8 – 9 people, but the floor area is only 118.1 ft² (11 m²). In the case of 8 users, this would give 14.8 ft² (1.37 m²) per person, and in the case of 9 users 13.1 ft² (1.2 m²). But see its dimensions to realize that it is totally impossible to put 8 – 9 sleeping pads for adults on the floor. Note that you have no vestibules to store the gear. So the declared capacity clearly makes no sense. This is a tent for maximum 4 people, perfect for couples and good enough for parents with one kid. They write that two queen size beds can fit inside and this is true but you would have not much space left. Climate-wise & seasons-wise, this is a tent for 2 seasons and a bit more. My reason for saying this is as follows. The waterproof rating is excellent and the fly covers most of the tent. But there are large mesh sections on two sides and on the top. So this is great for warm weather camping but not so great in a cool environment. The fly creates two small awnings above the doors. This is a great design for easy access, but it is not so good in strong winds. So I would avoid using this tent above the tree line and in windy conditions. Note that the tent is quite tall 72.84 inches (185 cm) which is great for the headspace it gives but less great if you have to deal with strong winds. For such an environment better consider some of the tents with full coverage fly. Weight-wise, with 18.74 lb (8.5 kg) this is not something to carry any distance, but this holds for almost any 8-person tent on the market. As I said above, this is not big enough for 8 people who would share the weight. Though it is reasonably lightweight, you will see how it compares with some of its competitors in the comparison table below. The packed size is in the range of the other tents of this size, 26.77 x 9 x 8.66 inches (68 x 23 x 22 cm). So this is a tent which should be used at places where you would not have to carry it. You can transport it even on a bicycle, in a kayak, on a motorcycle, and in the car of course. This is a simple design and the setup is easy, you will realize this from the features below. 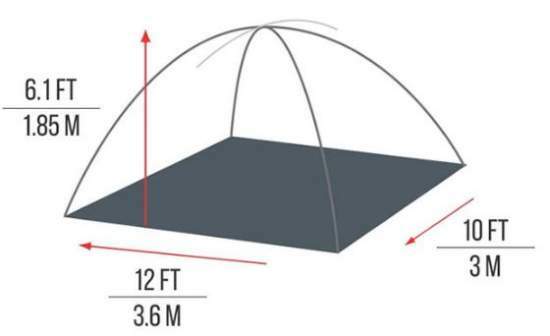 The tent comes with what they call Nano-flex fiberglass poles, so you have them two for the dome plus a shorter one that creates the two small awnings. They write that the poles are made with 100% virgin material ‘to provide additional strength and flexibility’. Frankly speaking, I am not sure how they would be weaker if built from recycled materials. In any case, you have a pin-and-ring system for the pole attachment to the corners, see the picture below. The poles go through the sleeves on the upper part of the tent, and closer to the ground they attach to the tent with clips. Some details from the construction. They use a 68D 190T polyester laminated with polyurethane so you have 2500 mm waterproof rating. The seams are heat-sealed, and they also claim that the material offers UV protection. So the tent is supposed to keep you dry in most conditions. The inner tent has sections with an ultra-thin no-see-um polyester micro-mesh which will keep even the smallest insects and mosquitoes out. This tent is built by a Brazilian brand so they should know what is needed for such creatures. On the floor you have a seamless and heavy duty anti-fungal polyethylene. This is a bathtub-style design. So I would say you are indeed completely safe from this side. There are 2 doors here, both large D-shaped and with a large 2-way zipper shown in the picture below. They are with panels which you must have because the fly does not cover them completely, plus with full mosquito mesh for protection and ventilation. Note that the mentioned smaller tents in this series have 1 door. There are no floor vents here. This is not perfect if you have to keep the doors with panels when it is raining. However, the side mesh sections go a long way towards the ground, and they are fully protected by the fly which goes to the ground completely. There is a utility pocket, far from enough as far as I am concerned, although they describe it as oversized. This tent meets CPAI-84 flammability requirements. You can read about these requirements in detail here. The tent comes with an E-cable port shown above. This is useful if you use the tent as an ordinary camping tent in well-equipped camps with infrastructure, though I was laughing when I saw it, the tent’s name Hunter somehow does not fit this feature. There is a lantern hook on the highest point on the ceiling. Far too small for the declared capacity. Type: dome style freestanding tent. Declared capacity: 8 – 9 people. Weight: 18.74 lb (8.5 kg). Dimensions: 10 x 11.81 ft (305 x 360 cm). Area: 118.1 ft² (11 m²). Area per person (for 8 users): 14.8 ft² (1.37 m²). Peak height: 6.07 ft (72.84 in; 185 cm). Packed size: 26.77 x 9 x 8.66 in (68 x 23 x 22 cm). See how this tent compares with two other tents built in the same style. The Eureka tent is with the same fly design, but the Kelty is with a full coverage fly and consequently offers storage areas under the vestibules. The NTK Hunter GT is the most affordable here. Please follow the links to check for updates. In the summary of this NTK Hunter GT 8 to 9 Person tent review I would stress again that this is a very reliable item with a great waterproof rating. The poles are fiberglass and need some care in handling and this would be the most important objection, but this is what makes the tent so affordable. This is a great value for the price. If you need more options in the same declared capacity range, please check my list with best 8-person tents. There are very different constructions in this group and the differences in the floor area can be huge. Check also their NTK Omaha GT 6 Person Tent which is a bit smaller but with a full coverage fly. Note that this Coleman Evanston 8 Family Dome Tent offers more space and it is also a dome style tent for summer camping. Please note that I am not paid by the brand and this is not a sponsored text. There is a comment box below so do share your views if you have some experience with this tent or the NTK brand. Have a nice day.